There were two ‘uniforms’ during WW2; the ones that the armed forces and voluntary services wore and the second was the uniform supply and control measures the government imposed on the population of Britain. From the outset, the government knew that clothing the people of Britain was the elephant in the room in terms of managing WW2. Wars are expensive; they require man (and woman) power, raw materials, armaments up to the job and enough of a profit to cover costs. That wasn’t all; the armed forces must be clothed and factories must still manufacture what was required whilst their working men were unavailable and away. The Anderson Shelter. Dug into the gardens of many homes, protecting against The Blitz. The blockade of Europe and danger in the seas meant essential supplies of raw materials like wool, silk and cotton would fast run out. Fabric and clothing production, a thriving industry at the outset of the war in 1939 was also inefficient and wasteful. Factories were needed to produce the millions of yards of material required to clothe people in uniform instead of the frilly and frivolous fashions of the late 1930s. Keep Calm and Drink Tea: The D Day Museum’s cafe surrounded by the clothing of war. Wasteful of fabrics in short supply, a simple thing like adding a large hem to a skirt or embroidery to a dressing gown could save thousands of hours of man power and materials required elsewhere. Working for the war effort: woman were employed in their millions to aid the war effort. Zips were a no-no as the metal was needed for armaments, as was elastic, and silk for silk stockings were needed for parachutes. Very quickly dressmakers and manufacturers were told that they didn’t have design freedom any longer and Austerity Regulations and Limitation Of Supply Orders – or LIMOSO’s – set out what they could and couldn’t use when designing or running up an item of clothing. Parachute Silk was used to make wedding dresses and offcuts or mistakes in factories taken to make bras and knickers. With the outbreak of war, inflation affected prices and the rarer commodities like silk started to shoot up in the shops. Inflation had to be kept under control and the economics of pricing became a hot issue; something had to give. The government accepted it had to control all aspects of clothing supply, manufacture and retail. Initially it looked back on the lessons learned during World War 1 when a form of standard suit was devised to clothe the people of Britain. They didn’t want to do the same, so unpopular was it, but needs must and from June 1st, 1941, Clothes Rationing was introduced across Great Britain. Information plaque about the parachute wedding dress. Whitehall was particularly concerned about the poor and working class who were perceived to be suffering most from the materials shortages affecting clothes production and supply. Middle and upper class women had large wardrobes that could survive rationing, they thought, but the working class didn’t. To address this, by 1942 the Utility Scheme was fully rolled out which produced clothing with quality cloth and materials designed and manufactured to Austerity Regulations. Utility Clothing was in the shops at fixed prices to ensure affordable clothing was available for all people across the land. Knitting for the forces: women knitted for the men overseas and the gloves, balaclavas and woollies were gratefully received. It attracted none of the new and dreaded Purchase Tax which affected all non-essential items. Utility was cheaper, of better quality and more long lasting than non-utility items. For the first time working class women could buy well designed, well made clothing to survive the war years regardless of income. War was different for those with more money at their disposal. They were used to buying for pleasure and to dress for the right social occasions but it didn’t make any difference to the government, they restricted how many items of clothing could be bought by anyone in the country. The press coined a phrase to describe the actions of government and “Wartime Socialism” was born. On the Whitsun Bank Holiday Sunday of June 1941 a wireless broadcast told retailers and the British public that from opening on Tuesday morning, all clothing would be rationed. Margarine coupons were initially used but later on dedicated clothes rationing books were circulated. Mrs Sew and Sew gives the rules that working class women already understood. Clothes had points allocated to them, usually determined by square yardage of cloth and whether the government deemed them necessary or a luxury item. Each point or half point was worth a full or half coupon. People were told how many points they had to ‘spend’ over periods of time, 66 in the first year and less and less as the war drew onwards. When spending on clothing people exchanged their coupons and paid cash also. When they ran out that was that, there were no more coupons to spend for anyone. Budgeting for how many points you had was a national occupation and a source of misery for many. Although forces uniforms were not rationed, things like knickers and maternity clothes were. The government adopted a form of market research to respond to national need and changes were made regularly, filling the columns of newspapers and fashion magazines. The beauty of war: the map showing the seascape between Britain and occupied Europe. It was no good moaning; the government was entirely in control. 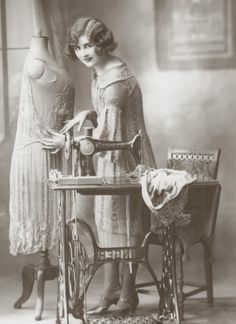 Many people commented that Mrs Sew and Sew’s advice in the famous Make Do and Mend campaign had been part of working class life forever and wearing second hand clothes and hand-me-downs was no different during the war than beforehand. The wealthy who did have money to spend regardless of rationing tried other methods and the black market thrived on those with cash to spare. Purchase Tax was implemented to prevent the buying of luxury goods; fur coats, a common staple of many a woman’s wardrobe, attracted 100% Purchase Tax for instance. That meant you paid the retail price to the shopkeeper then exactly the same amount again went to the government – very pricey. Women’s clothing was rationed and controlled. All made sacrifices for the war effort. Buying luxury was expensive and prevented excessive spending on items that weren’t necessary – after all if everyone bought unnecessary items, factories would have to produce them to demand and they were focused on war. Eventually the country learned to knuckle down and see it out. Whether you were rich or poor, the regulations applied and everyone did their patriotic bit to adapt. Southsea, near Portsmouth was no different from anywhere else in the country in what it had to endure. On the shoreline of the beach there is a museum dedicated to D Day, which took place on 6th June 1944. It is appropriate that the museum is situated there as The Solent holds a long military and naval history. The castle looking across to The Isle Of Wight has existed in one form or another since Tudor times. Southsea Castle. A setting with a clear blue view to the sea. The Mary Rose, Henry V111’ths ship which sunk in 1545 resides in its low lit museum in the Portsmouth Dockyard. The D Day Museum itself houses The Overlord Tapestry, a modern interpretation of the Bayeux which stitches together scenes from that day in a long piece of embroidery circling the main room. The impact of the government’s measures in respect of clothing and apparel in WW2 was an enormous undertaking both for Whitehall administratively and for the people of Britain to comprehend and live through. Everyone but everyone was affected; women, men and children did not escape and those in the forces also. When all rationing ended in 1952, the war years had seen a massive change to clothing and fashion. Not only about the sirens: changes to clothing made during WW2 has an influence felt even today. The change was both attitudinal and practical; the efficiencies that the government implemented were strong enough to bear any national dislike and the influence of them affects fashions and expert consideration of those restrictions even today. Throughout the D Day museum, the exhibits show how wartime fashion worked on the ground; for those in uniform, getting married, knitting for the forces or wearing Utility designs. It is an extraordinary museum which isn’t only about the conflict – the presence of the Overlord Tapestry emphasises the great importance of the needle trades to Britain and the creativity, craft, ingenuity and adaptation that the British public made overall. My most recent vintage purchase-a pair of British Home Stores shoes. I found them at the beginning of last week. They were set out in the tumbled shoe section at the local Oxfam. There they were, winking at me while I walked past the window all perty, cheery and cheeky, apple red against the rain and pavement greys and cold of earlier this week. I needed to walk by but 2 or 3 steps later my feet took me back. They forced me. Damn my shoe addiction, I am completely at its mercy. They wanted to see the flash of colour in the shop window for themselves. They conspired against me, the shoes and my feet. “they have low heels too,” said my feet. Apple red – gorgeous with summer blues and greens. My head adjudicated, fought and lost the battle – they were even in my size. Soon they nestled at the top of my bag and peeked out at me from the floor all through the next meeting. BHS shoes – just the right sort of red and embossed leather too. When I walked away with them in my bag this week none of us knew that the battle to save BHS would fail. Since then it feels the British high street has lost more of its retail heritage, our retail heritage. I’m not the only one confused by why this has happened. It seemed to be so promising. I was rooting for its survival, it felt as if we all were and we were pulling together as one. Once the troubles were announced I went in to browse and was surprised by their range. I bought some towels and pillows, because they were nice, not because I felt I had to. The staff were helpful and friendly. There was none of the sense of economic doom when Icelandic firm The Pier went into administration. In 2008 the gobal financial crisis meant names were toppling left, right and center. Holes and gaps in local high streets grew more often than new business as we sucked in and tightened our belts, but BHS remained. If they are so nice, why didn’t I find them in BHS at the time? I’ve been thinking about these shoes differently since the news. They are as attractive as the photos show them to be in real life. I don’t think they are that old, probably sold in BHS in the 90s – so why didn’t I find them at the time? Because I didn’t go into BHS is the answer. I didn’t believe you could find lovely items to wear like these in there or if you did it’d be a fluke, too expensive or too mumsy. They aren’t so, since Thursday, I own a piece of fashion history as well as a nice pair of shoes. They are a symbol of another story also. It’s the one about the end of the British high street of the past – one where Buy British was an advertising catchphrase, no eBay or online existed and quality of design and materials resulted in items like these. BHS may have been established by a team of American investors but they gave us something that is part of our culture, our memories and our history. BHS and the British high street deserves to survive! Book Review: Couture or Trade: An Early Pictorial Record Of The London College Of Fashion by Helen Reynolds. Patrick Grant and May Martin provide feedback about a skirt as Claudia Winkleman looks on in wonder. Since The Great British Sewing Bee hit our TV screens, evening classes, fashion degree and pattern cutting courses have been inundated with a resurgence of interest from applicants who want to learn the skills required. The influence of the GBSB shouldn’t be underestimated – since it’s aired sewing skills have exploded into the nation’s consciousness with a fervour last seen in the late 1940s and 1950s. You Tube is brimming with tutorials taught by gifted amateurs and professionals alike and home sewers watch Sewing Bee with stitching fingers twitching as we follow contestants’ efforts. These days we are used to looking at the efforts of the GBSB contestants in glorious technicolour in the hour-long slots on telly. But how did women learn the skills for sewing in the old days, long before TV was invented? The answer can be found in Helen Reynolds’ book Trade Or Couture, An Early Pictorial History Of The London College Of Fashion. When Reynolds uses the word ‘early’ in the title of her book she means very early; 100 years ago until the final days of the great training colleges of London in the 1950s. The majority of this book focuses on the 1920s and 1930s though and it isn’t only factual description – the book is beautifully illustrated with photos. In those days London was Great Britain’s go-to-place for all things fashion. It was a vastly important industry and it was necessary to staff it with women and men who had developed the not inconsiderable skills that were required. At the turn of 19th to 20th Century the London fashion industry was suffering from a shortage in supply of people with the correct skills. Trade and staff were being lost to Paris, the acknowledged global capital of fashion as a result. Recognising this, 3 trade schools were established in London. Eventually these schools became subsumed into creating The London College of Fashion. Then though, girls joined at primary or secondary level and spent their time learning the essential skills for employment in the London fashion houses when they graduated. Now you may think of industrial sewing machines, large mechanical cloth cutters or computers and clever graphics packages like you’d find in the courses taught these days, but you’d be wrong! The clothing industry was very different in the early days described in Reynolds’ book. Everything but everything was done by hand. Measuring, designing, drafting, stitching, embroidering, cutting and finishing – the essential skills – must be done well and by hand or not at all. In one section she describes how a lone sewing machine exists in a classroom but that it is barely used. Embroiderers used more machinery than tailors but the intricate, meticulous and highly expert skills we associate with Haute Couture these days were what was required. For educators this book is a fascinating wander through the relationship between industry and education that existed at the time. There was such an explicit correspondence between the output of skilled labour from these trade schools and the London industry that the two could not be separated. Mrs Robert Mathis or “Poulin” was a society dressmaker. 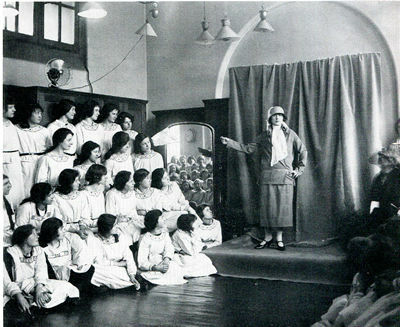 She staged this mannequin parade for Barrett Street students in 1924. Teachers were often skilled tailors with no formal teaching qualifications and as many of the large black and white photos show, from mannequin parade to classroom the schools were set up for one reason only – to staff the London fashion houses, full stop. So what would your day in a needle trades school be like? It depended on what age you were and what speciality or stream you were studying. You could specialise in embroidery for instance or pattern cutting. You had dedicated classes in these subjects but you also spent time learning skills in fashion illustration which meant drawing gowns and outfits in a life drawing class. Your uniform denoted which ‘stream’ you’d chosen. Health and safety was not neglected either. The schools knew that the industry brought risks in terms of workers’ health and so PE lessons and games were as vital a part of preparation for the workforce as the needle skills themselves. The schools were essential for career progression as well. Once employed by the London fashion houses, many women found themselves stuck in one position and on-the-job training was not available to them or ineffectual. As a result the schools ran evening classes to update and expand on tradespeople’s skills. This, in turn, increased female expertise in the workplace which had a knock-on effect of increasing the earning power of women also. Throughout the book there are large black and white photos either to advertise the schools or advertise the students’ work at the time. For non-academics or people simply interested in getting an insight into fashion history it is in poring over the photos that you’ll get enjoyment from this book. Women working in the needle trades updated their skills in evening classes. Image from Couture Or Trade: An Early Pictorial Record Of The London College Of Fashion. They show moments in the learning process frozen in time. Most of these photos have been set up with a camera in mind. Pupils are posed with hands poised like Greek statues, modelling their finished creations. Classrooms are quiet and static, quite unlike how they would have been in reality. It’s as if the reader is the school inspector coming for a visit or an employer seeking out their next staff member by examining each pupil’s work. They are a joy to examine. You can see how hand embroidered dresses fell straight to the floor in perfectly crafted folds or how gowns were drawn, drafted, cut, made and modelled with the essential plumes expected at Court. In many ways though this book shows you that the basic skills are still the same. You still have to know how to fit a dress to make one from scratch whether you are a tailor or a home dressmaker. You still have to know how to finish seams whether you hand baste them or use a foot on your sewing machine. It’s the transferable skills over time that make the book more than scenes from fashion history – most dressmakers and tailors will immediately be able to put themselves into these photos as they recognise themselves in the rooms. There is a covert message in the book however and it’s that these skills can take years to develop properly. It makes the 3 – year fashion degree courses of today seem almost a breath in comparison. It’s a book for academics, educators and fashion lovers alike but for those of you into the 1920s and 1930s, I’d say it was essential reading. The film Dior and I premiered last year at the Tribeca Film Festival and huzzah! it is now available for the everyday fashiony folk to soak up on Netflix. “People are utterly fascinated by what would happen at this house,” says Cathy Horyn, fashion critic at the New York Times and there’s no argument from the viewer. At the end of ‘Dior and I’ we capitulate in the film’s friendly, easy style, to the gravitas of this brand. The name Christian Dior has taken center stage since he opened his first atelier in Paris. A year later in 1947, his ‘New Look’ indelibly altered women’s fashion. Dior is a house with so much “fashion DNA” that it instantly conjours up the exclusive world of cigarette-slim models, impeccibly glamorous magazine covers and the starbursts of endless flashbulbs on mirrored runways. But what makes film fashionista Frederic Tcheng’s docco unusual is its timing. In choosing to centre his documentary around the arrival of Raf Simons to the House of Dior as Creative Director – the Belgian fashion designer broke into the fashion world in only 1995 – he takes us on a journey through a radical change in the house. Throughout the film you sense that risk but also how enervating and modernising Simons’ process and ideas are. He is told that managing the ‘human element’ is crucial and the reason for that unfolds. Florence is introduced to him as the Premiere for dresses and for suiting the Premiere is Monique. Monique is so important that she is sent to New York with a salesperson at the drop of a hat because a client is unhappy with the fit of a garment. Simons reluctantly accedes to this fact of life in the midst of the 8 weeks he requires her to complete his collection. Simons doesn’t sketch. His ideas are prepared visually in ‘files’ of concepts, others sketch those ideas, stylists translate them onto computers, he chooses 3 or 4 and when the decision is made, the seamstresses and cutters get to work interpreting these sketches into the 3D outfits. The Atelier Team Choose The Design They Want To Work On. When the sketches arrive Monique lays the designs on the table, the white coats gather round and as she talks through the designs, and people volunteer to make them. Dior aficionados will know that they are wearing the same white coats that hark back to what the mild mannered man wore in the same atelier in the original days. Making the designs into garments is a surprisingly democratic process when you consider that the sketches are just that. Sketches. Unlike paper patterns home dressmakers are familiar with, these designs do not come with instructions. Once you compare the start of this construction process with the finished garment, your respect for the skill of the workers in the ateiliers triples. When you watch the team bring in reinforcements to unpick cloth with thousands of tiny glistening hand sewn beads without a swear word or moaning – just a short nap in the small hours and then back to it – it will triple again. Unpicking cloth sewn with thousands of beads. Not a moan heard from any of them! Monique and Florence are rightly revered for their talent. Simons knows about Dior, of course but he finds the future more romantic than the past. As an hommage to the great man, his first collection is inspired by Dior’s designs, particularly the silhouette of the New Look collection and his exquisite textiles. Fashion lovers will enjoy these segments – they are delicious glimpses into the past. Gloved hands gently touch the archived textiles and clothing designs. They are kept rolled up in a way that makes you wonder if they understand how priceless they are to us as viewers but the gentle way they handle them tells all. “Juxtaposing something of that time with something of this time, is very dynamic,” says Simons. And Tcheng uses this historical reference too. He includes clips from a documentary made with Dior before his death in 1957. A whimsical and entirely French retrospective it weaves through the film drawing the viewer in like a fairy tale, grounding us in a sense of the past. ‘Dior and I’ reminds us of how the glossy spreads of haute couture we flick through is the end result of intricate, expert craftsmanship, design work and, let’s not forget, the clarity that comes with razor sharp business sense. Tcheng illuminates the rarified, closeted world to show us again why it has so much fascination – because of the secrets it holds and the talents it represents. “I bought a jacket in the thriftshop in Poland with the tag of this company. Everytime when I find any interesting things I’m checking its value, company where it comes from, price in the online shop etc,” she said. Found In a Polish Thrift Shop. An Elka Couture jacket. Image courtesy Monica Piekielniak. “It’s unbelievable that a jacket from 60’s in UK moves to 2015 in Poland!” she added. Hanging in a Polish thrift shop, waiting for the right person to discover it. Image courtsey Monica Piekielniak. Since she’s found out more about the Elka Couture brand she doesn’t wear the jacket, keeping it as an “interesting item” in her wardrobe. How the jacket ended up in Poland will always remain a mystery. If any Polish readers know who owned the jacket, post a comment here to let us know! The box jacket from the back. Image courtsey Monica Piekielniak. We’d love to know what your decision was, Ray and if you have some photos from portraits you took, go ahead post the link to them here. Jacqui Taylor is the proud owner of an electric blue textured synthetic dress suit made by Elka Couture. It was designed in a twin-set style that was very fashionable in the 1960s and 1970s. Elka Couture 1960s or 1970s Suit Jacket. Image Courtesy Jacqui Taylor. Thank goodness it survived the fire, Jacqui. “No, there are no washing instructions on the dress or coat,” she added. Elka Couture Dress Suit Jacket. Image Courtesy Jacqui Taylor. How can you date this gorgeous outfit? A law was passed in Britain in 1986 to insert fabric care labels – or laundry symbols – into all garments made in the UK. Between 1963 and 1986 the typical washing machine and temperature symbols that are so familiar to us today were sewn less frequently into garments and were not included at all before the 1960s. Jaqui’s outfit had no such labelling. That, the synthetic textured fabric and the style helps to date it to the 60s or 70s. What a beautiful eye catching outfit with over 40 years of history behind it. “I’m interested if Elka Couture was much known company in UK? Was they selling haute couture clothes …as its name suggests or it was something like the whole network of shops, or the only one in Hull? Elka Couture was a label that was based in London in the UK. It produced fashions mainly between the 1960s and the 1970s. Its designs were always eye catching and used 60s or 70s synthetic fabrics that were sometimes bold, sometimes glamorous and always unique. Your jacket is unusual because it is made of natural fabric – cotton. The early Elka Couture label on Jacqi Taylor’s dress suit jacket. Elka Couture designs reach across the years since to attract people like you when you find them in the rails of charity shops, in auction houses or in vintage markets. A maxi dress with the Elka Couture label was donated to Hull Museum because the label was sold at the House Of Mirelle – and that’s where your search started. Follow me here as I blog more about Elka Couture, Hull vintage fashion and the House Of Mirelle. If you have an Elka Couture item take good care of it, it’s a part of British fashion history..
With the plaintive wail of air raid sirens in the air, half of the British workforce in uniform and the impact of rationing, the 1940s had a stark divide between fashion during World War 2 and fashion after the war ended. In 1939 when the war broke out, women were wearing what we’d regard today as ultra feminine outfits – wearing trousers was frowned on and not yet accepted widely – it took the war to change that view. In 1939 women wore dresses. It took the war to make trousers acceptable. In 1939 skirts were worn at knee length and dresses with fitted bodices and pretty sleeves were all the rage. Fabric was in abundance and the influence of the new synthetics like rayon and rayon silk was everywhere. Every woman accessorised with a hat and gloves. Shoes were mid height with fancy patterns and colours, designed to be as attractive as the rest of her clothes. Young women dressed in pared down versions of clothes from their mother’s generation. Women strove to wear outfits, not items. Women of a certain class had to factor in dressing for different occasions also. These women changed into different clothes for dinner, if they were having afternoon tea with friends or if they were going out to a restaurant, for instance. The wealthy fashion conscious British woman did this because it was right, it was proper and it was expected. In London the Savoy restaurant had a dress code for evening; women’s gowns had to be floor-length to gain entry. Despite the restrictions of the war, the elite found that Britain continued dressing to this expectation, keeping a stiff upper lip in the face of wartime austerity. It was the good manners and social rules prior to the war that created a fashion industry revolving around the famous British social norms of what should be worn and when. Fashionable evening gowns: autumn winter 1939 to 1940. These were the social rules that gave The House Of Mirelle a wealthy clientele in Hull who could commission and afford the clothing that the fashion House created. The average women bought mass produced clothes from catalogues, local stores or made them at home. Paper patterns were widely available, as were sewing machines that often permanently sat in the corners of living rooms draped with items in various stages of creation. Sewing at home: as normal then as watching TV is today. Sewing skills amongst women was considered as important as knowing how to cook and were used regularly. It was usual for those with very little money to rework clothing, patching and mending. Hand-me-down’s were passed from person to person to get the most wear from them. Only the wealthy could afford to have their clothes made for them by dressmakers, tailors or seamstresses. Couture meant exceptional service. It was hands-on, expensive and labour intensive. It meant that clothes were designed, cut and made to fit your specific measurements by expert craftspeople. Expense wasn’t spared and outfits cost a lot of money. At the outbreak of war, buying couture was a concern for the upper classes, one that the average person might know something about but not have direct contact with. Picture how the country felt when on 3rd September 1939 Prime Minister Neville Chamberlain announced in sombre tones that England was at war with Germany. It was the second time in under 25 years the people of Britain had faced that stark news. Clothing had been rationed in World War 1 and it was a terribly unpopular move. When Winston Churchill became British PM, he didn’t want to do the same again. Up to the war, Paris ruled the western world’s fashion industry. It was considered the most innovative and cutting edge in terms of technique and design. Paris set the styles and shapes and the world always followed. Then war broke out in Europe. 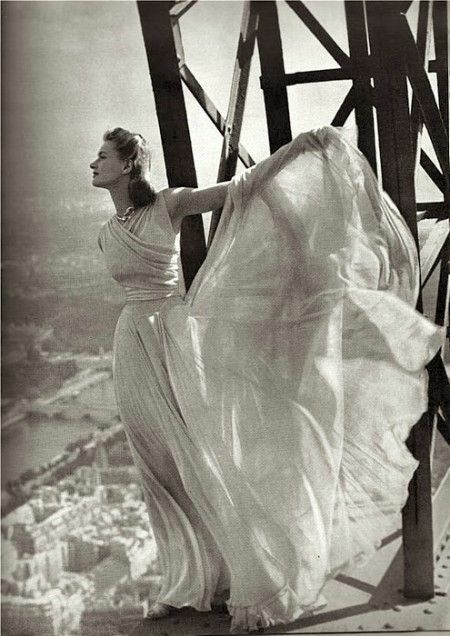 Within a year Paris, the center of fashion and couture, fell to the Nazi’s. The industry and its influence on fashion temporarily eradicated as a result. It fast became apparent to the manufacturers of clothing and the government that there were problems with sourcing materials and selling clothing as they had done pre-war. Although Great Britain was an island nation and to a limited extent was self sufficient in terms of materials and manufacture, the fall of Europe created problems with the scope of design, supply and manufacture of clothing. At the start of war, UK textile and clothing manufacturing was a healthy industry with many factories operating across the country – particularly in the North. Clothes factories and British couturiers like Hardy Amies often used locally sourced and woven fabrics such as British wool and cotton. However there was also a necessary market for imported cloth or textiles from outside the UK. Long established trade routes no longer existed due to the Nazi blockade of Europe, silks were unavailable due to the same destruction of trade routes with China and Japan. The government saw problems on the horizon. Problem 1 – you can’t make clothing without textiles. Problem 2 – those very same factories and the personnel in them were needed for the war effort. Very soon after the war began the import textile market was suffering from the global crisis. The influence of Paris had also crumbled and the lack of spare cash in the pockets of the everyday person meant the fashion economy was heading for a crash. In 1939, writing for Mass Observation in the first months after war was announced, Pam Ashford from Glasgow said:” Miss Bousie bought a battery in a tailor’s shop. It is the only thing they are doing. No one wants clothes.” The rich were still able to afford their clothing, but the poor could not. Clothes rationing came into being in June 1941 by an act of parliament called the Limitation of Cloth Supplies and Apparel Order. It wasn’t the only commodity that was controlled by the government but in our thinking, the CC41 scheme relates strongly with the fashions of the war era. The scheme was called CC41, it started in 1941 – hence its name and design found on the Utility labels from the time. Some people think that the ‘CC’ in CC41 stands for “Controlled Commodity,” however this isn’t accurate and it has come about my misreporting of the time. The two cheeses: the CC41 label. The idea behind CC41 was to control the fabrics, the designs and the manufacturing processes used to produce clothes. Clothing designed under CC41 rules was called ‘Utility Clothing’ by the British government. The Utility Scheme directly influenced clothes rationing. It was a way by which designers and customers could survive the limited supply of materials and protect what was needed for production in the war effort. There was another element to the Utility scheme, however. Churchill expressed a view that he specifically wanted to avoid the British public being dressed in: “rags and tatters.“ He saw it as patriotic to remain as well turned out as possible with clothing enhancing the morale of women and men during war. The CC41 logo designed by Reginald Shipp is affectionately known as The Two Cheeses. When it was introduced, clothing ration books hadn’t been printed and people used spare margarine coupons to buy their clothes instead. By freeing up fabrics and materials and the factories that made them, it focused more resources on the war effort and kept fashion standards for everyone in Britain too. Historians argue that Utility clothing changed fashion, democratising quality clothing for all. The government devised a set of penalties and incentives for manufacturers to support the initiative. Green Rayon CC41 Dress from the British retailer Marks and Spencers. Manufacturers who made 85% Utility Designs were then allowed to make the rest of their items in non-utility cloth but the 15% of these “other” designs still had to follow the same restrictions and regulations. Non Utility clothing was taxed heavily, regarded as luxury items. Times were hard and people railed against the restrictions that rationing created. The government asked British Pathe to help inform the public about the new rules. People watched these films in cinemas which were hugely popular – the time of having a television in the home was a speck on the future sight line of mass entertainment. CC41 and Utility Clothing has become iconic and legendary and its influence has been felt throughout the fashion industry. A CC41 label indicates that it is a valuable and historic item of clothing. In 1942 regulations were tightened by the introduction of The Making Of Civilian Clothing (Restriction Orders) but relaxed at the end of the war where a new “double lines” Utility label emerged to indicate that the fabric used was of a higher quality than that found in clothes with the CC41 label or Utility designs. The ‘double lines’ CC41 logo heralded a more luxurious Utility range in 1945. The double lines label indicated that it was a more luxurious item than earlier items. Frocks could use a better quality of fabric and be designed with more flair. The public felt that the frivolities of fashion may be heading back into the public consciousness again. In reality, it was a long way off. Fashion rationing didn’t end in Britain until 1949 long after the end of the war, but the legacy was felt deeply. It was in this period that the powerful idea of making quality fashions accessible to all was born and from it, women’s fashions changed permanently.